One square tower, a few walls, and an arched gateway are all that remain of Macroom’s most historic building.It was built in the 13th century by the Carew family. Later it became the property of the Mac Carthys. Teigh Mac Carthy repaired it before he died there in 1565.
tegic position of Macroom has led to many battles and conflicts in the area and the castle buildings were frequently destroyed by fire. Cardinal Rinnucini was a guest of Lord and Lady Muskerry McCarthy. In 1650 there was a major battle between Cromwell’s forces led by Lord Borghill and those loyal to King Charles under the command of Bishop Mac Egan. Macroom Castle being handed over in 1656 to Admiral Sir William Penn, father of William Penn, founder of Pennsylvania. [1644-1718]. In 1660 the Castle was again restored to the McCarthys when King Charles II regained the throne in England. In the Williamite Wars of the 1690’s the Castle was confiscated from the McCarthy’s and sold by auction to the Hollow Sword Blade Company of London. During the 18th century it was owned by the Bernards of Bandin, The Hedges Eyre of Mount Hedges, Macroom and finally by 1800, it came by marriage into the White family of Bantry. The spacious Town Square dates from the 1750’s. The last owner was Olive White who married Arthur Guinness of Dublin (the same family famous worldwide today for their Black Stout beverage). The castle was burned again during the Civil War [1922-23]. The anti-treaty forces, including Erskine Childers and the famous writer Frank O’Connor, had retreated from Cork City to Macroom. Being pursued they burned the castle before retreating westwards to the mountain districts. 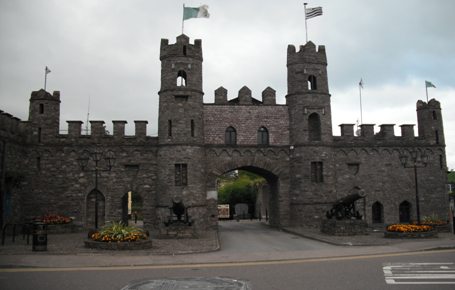 After the Civil War the castle grounds were bought by a group of Macroom businessmen to be held in trust for the people of the town. By 1966 the Castle was in a dangerous state and after a serious accident nearly occured, most of the Castle Keep was demolished. The basic structure was preserved, and the grounds laid out for Bishop McEgan College a sports field and a golf links. Recently the entrance has been renovated and two 18th century naval cannons, found in the grounds, placed on each side of the gateway.